Get similar-to-DPI precision in analyzing data traffic without the hassles of deploying and scaling DPI solutions. Our proprietary machine learning and big-data technologies leverage NetFlow as a data source to unrivaled precision in the networking industry. As a network operator, every second of downtime counts and pressure amounts. We've designed every graphic and every dashboard to help you find the critical data first. System Wide Filters, Responsive Timeline Selection and quick View Switching help you move around hundreds of devices or subnetworks, finding issues in a very intuitive way. Get DPI-like network intelligence with NetFlow. Get the data you need without the costs and scalability issues of DPI. What are the different modules? Our 3 modules: Traffic Intelligence, Threat Mitigation and Peering analytics with their respective APIs is where you get all the functionality. The Network Intelligence Platform are the systems and technologies that support all of it. The platform and modules are available in our cloud as a SaaS service or can be acquired as a license for on-premise deployments. 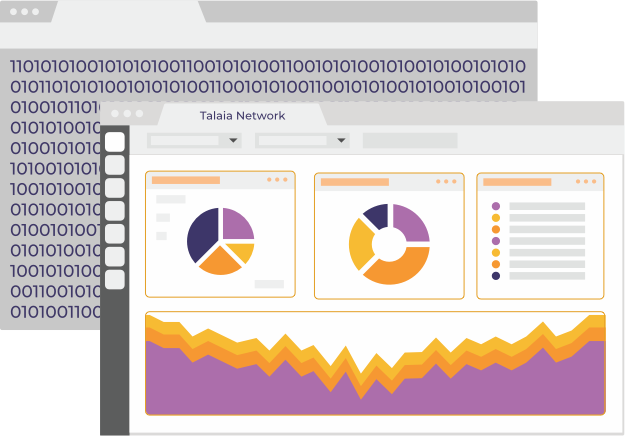 Our demo allows you to explore Talaia's interface using a predefined, anonymised set of data. This data never changes, and you can use the demo to explore Talaia's user interface without making any changes to your own equipment whatsoever. Often times you need to retain control of your data – especially, due to regulatory issues. When designing our Network Intelligence Platform, we engineered it from scratch in a way that the on-premise version had the same functionality and flexibility than the cloud version we designed for ourselves. We provide custom retention policies tailored to your needs. Fast storage of raw NetFlow/IPFIX data and time aggregates, for querying and filtering purposes along with fast performance dashboards. With compliance and forensics in mind, we've implemented custom policies with up to 24 months of raw NetFlow storage and we can adapt to most scenarios and needs.